When an opportunity seems too good to be true, it might be. Although we easily decline small opportunities, declining an enticing career opportunity can be enormously difficult. Here's Part II of a set of indicators that an opportunity might actually be a trap. 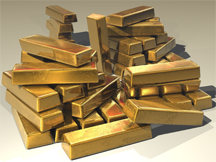 Gold ingots, one symbol of sudden and unexpected wealth. When an opportunity arrives with promises of sudden financial wealth, declining it can be difficult. Some once-in-a-career opportunities aren't opportunities at all — they're traps. For these opportunities, accepting what has been offered can be a career-ending move. We began last time with a vignette and a challenge. The vignette described how Terry, a project manager, received an offer from Paul, a program sponsor, to accept a position leading Marigold, a large but troubled project. Terry would become the fourth person to try to "bring Marigold home," as Paul put it. The challenge last time was to identify as many indicators of trouble as possible — indicators that would lead Terry to decline Paul's offer. Before reading further, you might want to review the vignette. I'll continue now with six more indicators of trouble. When the offer is expressed unusually deferentially, or when the person making the offer is behaving in an uncharacteristically charming manner, most of us might be taken aback, at least a bit. When the deference or charm goes beyond ordinary politeness and respect, and when it is counter to the relative organizational ranks of the deliverer and the recipient, the probability of entrapment is elevated. Entrapment is even more strongly indicated when the person delivering the pitch is not known as charming, or worse, is known as abusive, disrespectful, gruff, or ruthless. In the vignette presented last time, Paul mentions more than once that he's familiar with Terry's talents and achievements. That might be flattering to hear, but coming from a potential organizational psychopath, it can be a strong indicator of risk. The danger lies not in the good things Paul knows about Terry, but in what else he might have learned about Terry in the course of Paul's "research." Apparently, Paul has a new assistant. Because the story doesn't explain why he has a new assistant, we don't know if turnover in the assistant position is significant. But we do know that Paul is trying to recruit Project Manager #4, and it's possible that the problem is Paul, rather than the previous project managers or the previous assistant. Turnover in positions that work closely with the position being offered, or in positions that work closely with the supervisor of the position being offered, could indicate that the trouble isn't — or isn't only — in the content of the work. Such turnover could indicate that part of the problem lies in the difficulty of forming the stable professional relationships that are needed if the group is to attain its objectives. The immediate skip-level promotion is highly unusual in most companies. Promotions are usually incremental (step-by-step), and typically occur at only one time of the year. Most of us want to be regarded as exceptional, but a very few need to be so regarded. Immediacy and skipping levels appeal to people who have that need. Organizational psychopaths are among that very few who intensely need to be regarded as exceptional. They are more likely than non-psychopaths to expect that granting exceptions to the rules would be a convincing element of any offer. If Terry notices some of the elements of the entrapment pattern, he might become skeptical enough to investigate the situation in more detail, looking for confirming or disconfirming evidence of entrapment. Some of what he finds might indicate that the situation is different from what Paul described to him. For example, three people might tell him that the terminated project manager had misrepresented the state of the effort in status reports to the Executive Committee, making it seem less troubled than it actually was — an item that Paul omitted (see "The project is in big trouble" in Part I). And Eunice (the tech lead in the vignette) might tell Terry that she's been with the project only four months, and she can't answer most of his questions. Paradoxically, one sign of entrapment is the absence of disconfirming evidence. Truth is complex — no situation is completely homogeneous. Looking closely, we would expect to find factors (the positives) that make the situation seem more promising than we were told; we would also expect to find some factors (the negatives) that make the situation seem less promising than we were told. The absence of negatives is consistent with someone having "scrubbed clean" the situation by hiding negative data, or terminating or transferring people who might be too willing to reveal inconvenient truths. As a result, based on the evidence available, the situation looks more promising than we expected. And as a result of hiding disconfirming evidence or transferring people, the situation is a little different from what we were led to expect. might be evidence that it isset the trap (Paul in the vignette) is an organizational psychopath, one strategy might be to encourage the target (Terry in the vignette) to do some investigating. Paul expects that Terry won't find any disconfirming evidence, because the situation is scrubbed clean. Consequently, Terry will emerge from the investigation phase confident that the trap is not a trap. So remember: the absence of evidence that the opportunity is a trap might be evidence that it is. The more anticipated is the offer, the more likely is the target to be prepared to receive it. A prepared target is likely to know more about the opportunity than the probable psychopath would like the target to know. For example, if the situation has been scrubbed clean, the target might be able to determine the timing of any transfers or terminations, and might find ways to contact these people, even before the offer is made. Targets who don't anticipate the offer, and who receive the offer suddenly and with a short timeline for acceptance, are less able to conduct investigations that might reveal the opportunity to be a trap. Organizational psychopaths know this, and some might exploit it. Would you like to see your comments posted here? rbrenqTatjyZKrIzqCfvbner@ChaczCdjYGZJRQdEskhpoCanyon.comSend me your comments by email, or by Web form. When you find yourself in a tough spot politically, what can you do? Most of us obsess about the situation for a while, and then if we still have time to act, we do what seems best. Here's Part I of a set of approaches that can organize your thinking and shorten the obsessing. Project managers are responsible for managing risks, but they're often stymied by insufficient resources. Here's a proposal for making risk management more effective at an organizational scale. I offer email and telephone coaching at both corporate and individual rates. Contact Rick for details at rbrenHMuGmjSslEeArPnSner@ChacajyYPhPQhooxKvlIoCanyon.com or (650) 787-6475, or toll-free in the continental US at (866) 378-5470.